Deontay Wilder was unmoved during the weigh-in as Tyson Fury has to be held back. Tyson Fury came in three stone heavier than Deontay Wilder as both men were kept apart ahead of their WBC heavyweight title fight this weekend. After things boiled over at Wednesday’s press conference, security was beefed up and there was no such repeat of the ugly fracas, the two heavyweights keeping their cool as they weighed in. 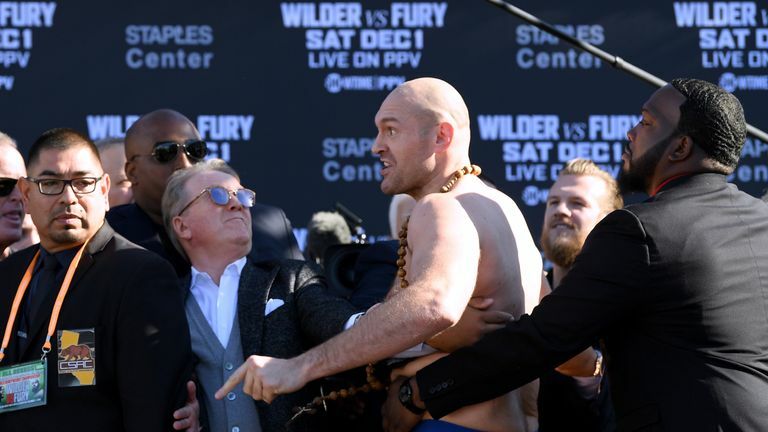 Fury fans were out in full force in sunny Los Angeles and ‘The Gypsy King’, who arrived in style hanging out of a jeep, was all smiles as he hit the scales at 18st 4lbs. WBC champ Wilder, wearing a mask, followed him and came in at a trim 15st 2lbs, the lightest he has been since he made his professional debut in 2008.